Ever wonder whom the Colossians that Paul was writing to were? Colossae is in the region of the seven churches of Revelation 1-3. In Colossians 4:13 there is mention of local brethren in Colosse, Laodicea, and Hierapolis. 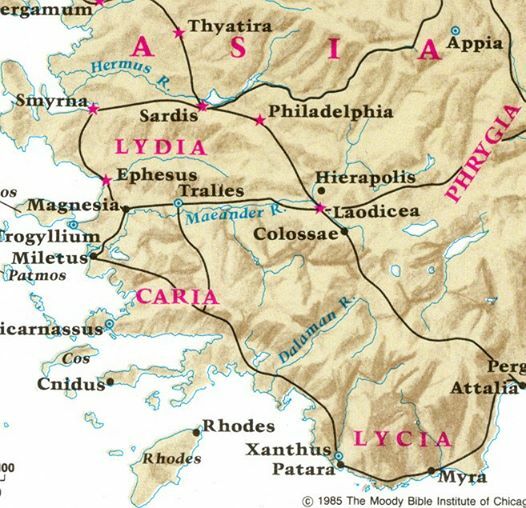 Colosse was approximately 12 miles from Laodicea and 14 miles from Hierapolis. Members of the congregation at Colosse had incorporated pagan elements into their practice much like Christianity has done today; including the worship of elemental spirits. The Epistle to the Colossians declares Christ’s supremacy over the entire created universe. So when Paul wrote to the Colossians, he was also writing to the surrounding cities. Paul taught Epaphras and he was most likely the founder of the Church of Colossae. These things says the Amen, the witness, the faithful, the true, the Chief of the Creation of Elohim (god). I know your works, that you are neither cold nor hot. I would desire you would be either cold or hot. So, because you are lukewarm—neither hot nor cold—I am about to vomit you out of my mouth. Revelations is often hard to understand. The reason Yeshua (Jesus) chose to speak those exact words is because it made it understandable those living around that area. Why lukewarm? It is because they had no way to get their own water. They had to pump in their water from Hierapolis, originally called City of Zeus, through an aqueduct system. The water in Hierapolis, from its beginning, was coming from hot springs full of minerals and sulphur (useful). By the time the water got to Laodicea it was luke warm; not very useful. It was full of minerals and tasted bad. Cold water and hot water have a purpose but lukewarm has none; another metaphor from our Messiah. The area was thriving in wealth. They even turned down money from Rome when they needed to rebuild. They had the best wool in all the land and had established a banking and financial center. The only thing they didn’t have is WATER or LIFE if you will. Without water there is no life. They became complacent in their following of Elohim (God). They quit following (Torah) and were okay with just doing their own thing.